Assault Spy | NIS America, Inc. Dash, evade, and smash your way to the truth as the corporate spy, Asaru! Uncover the dark secrets of the Negabot mega corporation as you save the company from a hostile takeover. 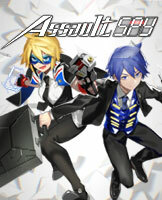 Assault Spy is a stylish, fast paced, pure-action game with a dash of comedy. Blast through an army of security robots and save the company that was taken over by terrorists! These crazy spies don't know what they are getting into! Defeat enemies and unlock new moves. The more moves you get, the more fun you have, and the cooler you look! Breaking through with amazing skills "Amelia." Different playstyles with interweaving stories! © NIS America, Inc. © Wazen. All rights reserved. Published by NIS America, Inc.